SWISS-ACM MANAGES, OPERATES, AND CHARTERS A MODERN FLEET OF VERSATILE AIRCRAFT THAT CAN MEET YOUR SPECIFIC NEEDS FOR INTER-CITY, REGIONAL OR INTERNATIONAL TRAVEL. The Challenger 300 was intelligently engineered from the ground up to provide class-leading comfort and performance in an economical package. Following extensive market research and client feedback, Bombardier's super mid-class Challenger 300 boasts a large cabin with low direct operating costs. With the ability to travel over six hours with a full compliment of 8-9 passengers, the Challenger 300 is the perfect solution for your mid-range travel requirements. The Gulfstream 200 has everything you would desire in a modern business jet: high cruising speed, long range, short landing capabilities, as well as a spacious stand-up cabin. 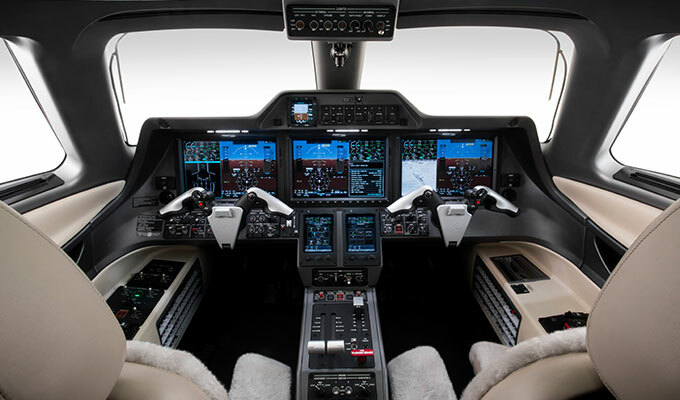 The G200 features comfort and performance similar to large cabin aircraft but at mid-sized cabin prices. This super mid-sized aircraft boasts the largest baggage capacity in its class and features on board amenities that have you arriving at your destination feeling refreshed. The Hawker 850XP & 900XP are iterative improvements over the proven Hawker 800 business jet first introduced in mid 80s. With over 650 of the type built to date, the Hawker mid cabin size family of aircraft are proven workhorses of business aviation. The 850XP and 900XP bring cabin and performance upgrades which cement Hawker's staying power as a market leader. Often referred to as the "conference room in the sky" due to its spacious cabin and layout, the 5 plus hour range will bring you quickly and comfortably to your desired destination. The quiet cabin provides seating up to 8 comfortably with a small galley providing hot and cold beverages and a mini bar, as well as an enclosed lavatory in the rear cabin. Revolutionizing the light jet market, the Phenom 300 was the most delivered business jet in 2013 and 2014. It boasts amenities and performance of much larger jets within sleek and efficient package. This is a new generation light, twin-engine helicopter with state of the art technology that offers operational flexibility to meet the most demanding of customer requirements. With outstanding levels of comfort brought about by an enlarged cabin, enhanced sound proofing, large windows and an exceptionally smooth vibration-free ride this helicopter becomes the ideal aircraft for VIP transportation. Robinson's R44 Raven Series Helicopters provide excellent reliability, responsive handling, and altitude performance, making the R44 the ideal helicopter for private, business, and utility applications. The Robinson R22 Beta II is flown throughout the world for many applications due to its dependability, low operating costs, and excellent performance. A powerful engine, a lightweight steel-tube airframe, and aerodynamic shape gives the R22 a cruise speed of up to 90 kts and an average fuel consumption of only 7-10 gallons per hour. The R22 seats two adults and occupants have panoramic views due to R22's large windows. Acoustical foam lowers cabin noise. A heavy-duty muffler and low tail-rotor tip speed lessen flyover noise. swiss-acm © 2017. All Rights Reserved.